I’m making this for an office luncheon, so I will bake the corned beef, wrap in foil and place in an ice chest, less the ice, to keep warm. I will slice right before serving. 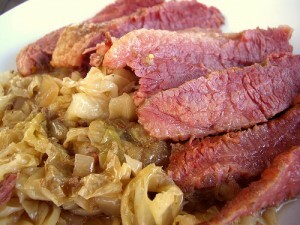 Also on the menu, sauteed cabbage, brussel sprouts and onions. Oven roast potato wedges, sweet potatoes and carrots. This will be our St Patty’s Day feast. All we need is a spot of mustard, and fresh ciabatta roll or cheesy monkey bread. 1 Preheat oven to 350°F. Drain the corned beef from the package and discard the spice packet. Lay corned beef, fat side up, on a large piece of heavy duty, wide, aluminum foil (you may have to get creative with the way you wrap the beef if your foil isn’t wide enough). Insert the cloves into the top of the slab of corned beef, evenly spaced. Spread the top with the hot sweet honey mustard. Sprinkle brown sugar over the top. 2 Wrap the corned beef with foil in a way that allows for a little space on top between the corned beef and the foil, and creates a container to catch the juices. Place foil-wrapped corned beef in a shallow roasting pan and bake for 2 hours. 3 Open the foil wrapping, spread a little more honey mustard over the top of the corned beef, and broil it for 2-3 minutes, until the top is bubbly and lightly browned. Let rest for 5 to 10 minutes, then place on cutting board and cut at a diagonal, across the grain of the meat, into 1/2-inch thick slices. This entry was posted in Beef and tagged Cabbage, Carrots, corned beef, Potatoes, sweet potatoes. Bookmark the permalink.